The City of Sunny Isles Beach Cultural and Community Services Department is offering a full complement of programs, events and trips in May. Patrons may sign up for their choice of any activity highlighted below at the Government Center, 18070 Collins Avenue or at Pelican Community Park, 18115 North Bay Road. 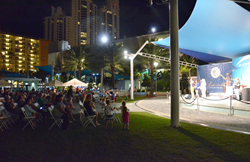 The Spring Ballet Gala will be presented by Arts Ballet Theatre of Florida on Saturday, May 9 from 5:30 – 10:00 pm. The bold, abstract, neo-classical ballet “Shostakovich Suites” will take place at the Aventura Arts Center. Seating is in Orchestra, Row C, 109 - 120. Tickets are $37 for Resident ID Card Holders and $42 for all others. Showtime is 7:00 pm. Golden Era Movie will be held at Pelican Community Park at 18115 North Bay Road on Tuesday, May 12 from 10:00 am – 1:00 pm. Settle down to be entertained in style as you watch You’ve Got Mail starring two of America’s 1990’s darlings of the big screen: Tom Hanks and Meg Ryan. Lunch follows the movie. Reservations are required, no walk-ins the day of. Event is free with SIB Resident ID Card and $5.00 without. The Sunny Serenade Concert featuring VIVA Classic Rock and Roll will be held on Wednesday, May 20 from 7:30 – 9:00 pm at Heritage Park, 19200 Collins Avenue. Admission is free. Parking in the Heritage Park garage & under the William Lehman Causeway is free beginning at 7:00 pm. Take a trip to Sawgrass Mills Mall in Sunrise on Thursday, May 21. The bus will leave from the Government Center at 9:30 am and return at 5:00 pm. Shop until you drop. Heavy walking is required to cover the 300 outlets at this premiere mall. Tickets are $5 for SIB Resident ID Cardholders and $10 for those without the card. Tickets may be purchased at Pelican Community Park, the Government Center. A Car Show & Farmers Market in which participants can view classic and muscle cars, vote for a favorite car and stock up on fresh produce and baked goods will be held Saturday, May 30 from 10:00 am – 3:00 pm. The location for the show and market is at Heritage Park, 19200 Collins Avenue. Admission is free. Parking in the Heritage Park garage & under the William Lehman Causeway is free beginning at 9:30 am. Please check sibfl.net, SIB TV, or Community Newspaper for more events. Call 305.792.1706 for questions regarding these or any other activities or programs.